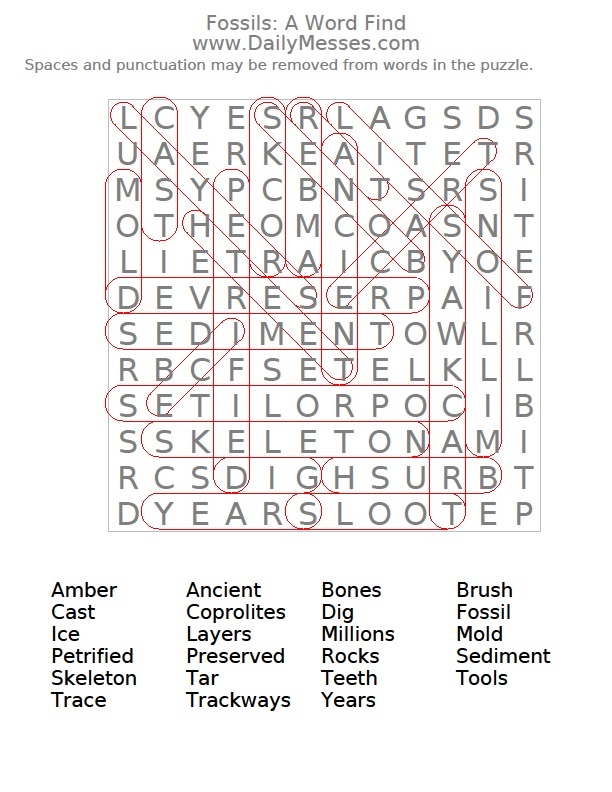 Today is National Fossil Day! I remember looking for trilobites in creeks with my Dad as a kid. In fact, there are probably still a few of them floating around my parents house in storage somewhere. My boys now love dinosaurs too. Bernardo is pretty much out of the playing-with-dinosaurs age and has moved on to Lego's, but Higgins still loves them. They both love looking for fossils though. We are lucky enough to find have a couple of fossil collection areas within an hour of our house. To find a fossil park near you, try looking at National Park System: Fossil Parks and Other Fossil Parks. However, I noticed that there weren't any listed in my area and I know of two within an hour drive. 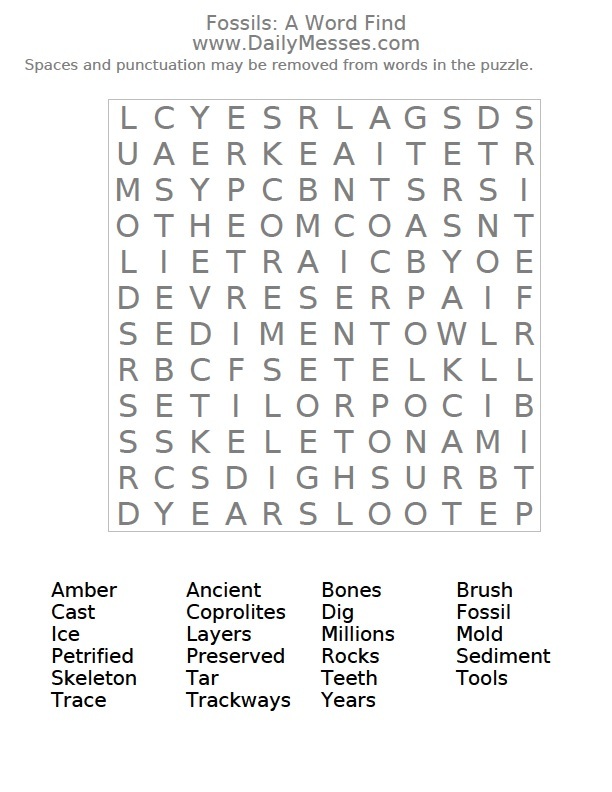 If you can't find one listed, try searching for "fossil park" or "fossil collection area" in Google/Yahoo/etc. The national parks usually will not let you remove fossils that you find, but many state and local fossil collection areas will let you remove small fossils. Of course, if you find a T-Rex they probably aren't going to let you bring it home. 1. Make a fossil with plaster-of-paris. a. Prepare thick, smooth plaster-of-paris. b. Pour about 1 inch of plaster into a yogurt or cottage cheese container. c. Brush a thin layer of petroleum jelly on the object (shell, leaf, etc.). d. Press into the plaster but do not allow it to cover the top of the object. e. Allow to set/dry for 24 hours before removing object. f. Brush a thin layer of jelly on top of the plaster. Make sure to get into any crannies. g. Pour about 1 inch of plaster on top and allow to dry for 24 hours. h. Separate the two pieces. The first (bottom layer) is a mold fossil and the second (top layer) is a cast fossil. 2. Find a fossil park and look for fossils. 4. Make dinosaur shaped cookies and use white icing to draw their skeleton ("fossil") on. 5. Try the Dinosaurs Galore! 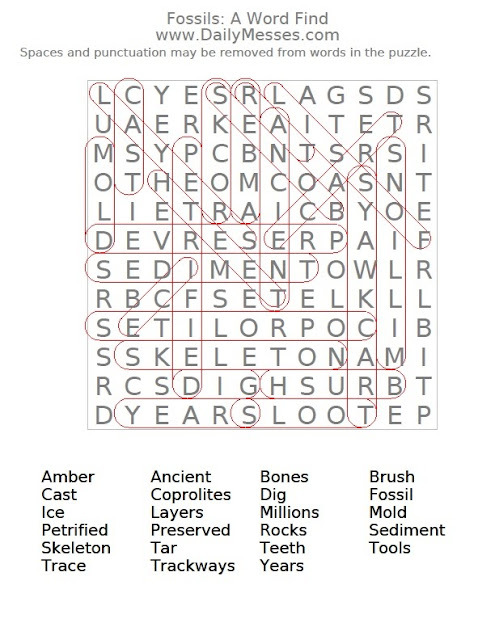 A Word Find. 6. Try the Fossils Word Find below. Rice Cereal Treats. Form the treats in a plastic egg and place dinosaur candy in the middle to create a special treat for the dinosaur lover in your life.